FEMORAL NECK FRACTURES – BIOLOGICAL ASPECTS AND RISK FACTORS. Department of Geriathic orthopedics, Vitosha Hospital - Sofia, Bulgaria. The strength of the bone is a function of its mechanical properties and bone geometry. The probability of the occurrence of femoral neck fracture is associated with both the trauma mechanism and magnitude of the acting forces as well as with the bone quality, the mental state, the incidence of falls, the use of medications, and other factors, the knowledge of which may help for better prevention of this devastating injury. Filipov O. Femoral neck fractures – biological aspects and risk factors. J of IMAB. 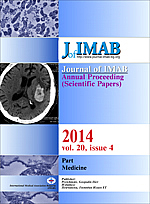 2014 Jul-Sep;20(4):513-515. doi: http://dx.doi.org/10.5272/jimab.2014204.513. 9. Panula J. Surgically treated hip fracture in older people. With special emphasis on mortality analysis. Doctoral Thesis. 2010. 14. Pauwels F. Biomechanics of the normal and diseased hip. Theoretical foundation, technique and results of treatment: an atlas. New York, NY: Springer-Verlag. 1976. 15. Melton LJ 3rd, Chao EYS, Lane J. Biomechanical aspects of fractures. In: Riggs BL, Melton LJ 3rd, (eds.) Osteoporosis: etiology, diagnosis and management. RavenPress,New York. 1988:111-31.